Fabric shower curtains are not as popular as they deserve to be. They are a little heavier than their plastic counterparts, that’s true, and there is always the need of using a waterproof liner. But fabric shower curtains look much better than PVC and they are much nicer to touch. What’s more, fabric shower curtains aren’t slimy to touch, something all too common for PVC curtains. They are soft and warm even when they’re wet. But the greatest thing is the fact that it is very easy to change fabric shower curtains into custom-made bathroom decorations. Drawing or copying the pictures on fabric shower curtains is very easy, the pictures don’t get washed and they look good. If you’re looking for a chance to add a personal touch to your bathroom decorations, painting fabric shower curtains are one of the best ways to do that. Unlike the walls, they can be easily changed at the moment you decide you don’t like the pictures anymore. 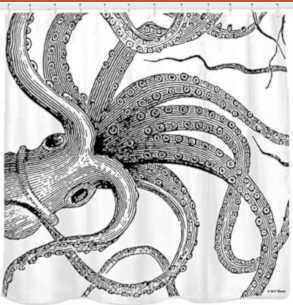 It might not be suitable for a very feminine bath, but the drama of this fabric shower curtain will fit into many decors. 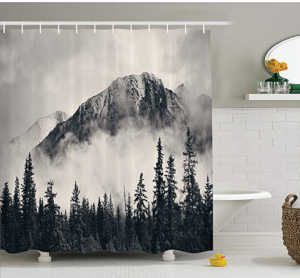 What about a foggy mountain on your shower curtain. This kind of scenery is extremely relaxing and would certainly have the effect of making a bath more tranquil and spa-like. Light a few candles and you have quite an inviting spot. This inspirational fabric shower curtain has a lot to like. 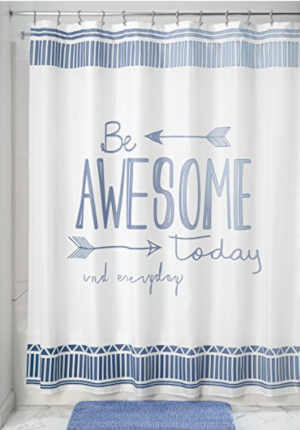 Who doesn’t want to be awesome and observing a reminder to see yourself that way every time you step in the shower is certainly not a bad thing. And secondly, these are cool, inviting colors that will go with all kinds of decors. Blue and white is extremely popular as a decorating scheme. We’ve been watching Property Brothers recently, the renovation and decorating show with Drew and Jonathan Scott. They emphasize decorating a home in a way that won’t upset potential buyers, yet offer a bit of pizzaz. This shower curtain definitely does that. 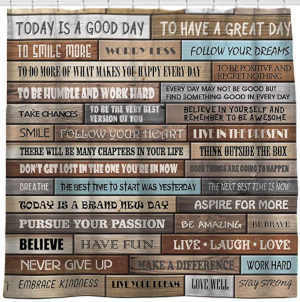 This is called a “motivational happiness shower curtain” and it is certainly interesting. It will keep your guests and family members entertained in the shower for quite some time. After all, there’s a lot to read there. 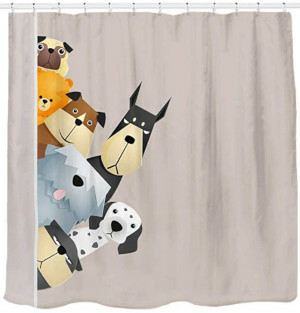 This dog shower curtain is perfect for any kid bathroom. I laughed as soon as I saw it which is certainly the reaction the makers wanted us to have. They have cat shower curtains, too, for those who love their feline friends instead of dogs.